Pack your jumpers and fetching scarves, it’s about to get real cool up in here. There’s nothing like gliding elegantly over a brightly-lit smooth ice rink (when you’re able to finally let go of the side barrier, of course! ), and watching kids navigate their way around is classic entertainment. It’s time to get out of your comfort zone and into the climate-controlled zone of the Melbourne ice skating rink. 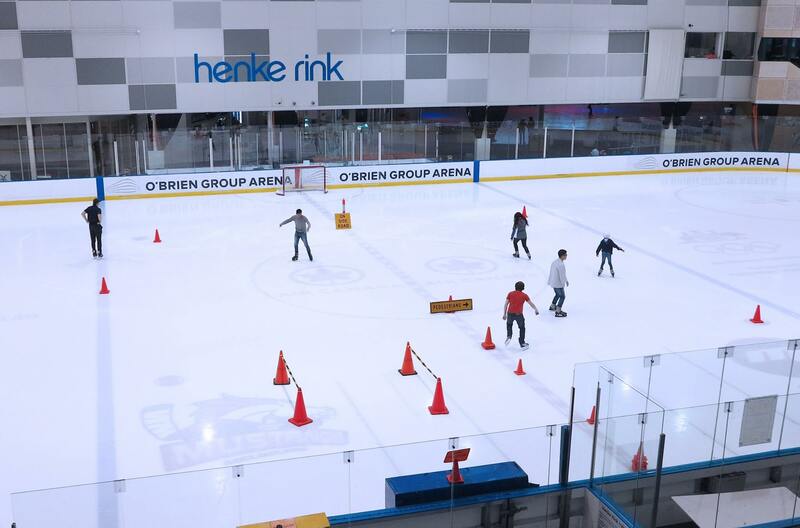 The O’Brien Group Arena in Docklands is a veritable one-stop-shop for everything you could possibly want to do on a rink of frozen water. Everything from tiny tot lessons to serious adult figure skating is on offer, including hockey lessons and games, speed skating, school holiday programs – even curling! Adults are encouraged to get out on the ice with their kids, so skate aids are accessible for everyone, and helmets and skates are available for hire. For adults wanting to brush up on their skills before holding up all their kids out on the ice, free 15-minute lessons are available at certain times during the week. If you’re looking for me, I’ll be at the Friday night RnB public skate, making all my 90s dreams come true (for those who prefer a more modern approach, there’s a neon skate on Saturday nights). There’s also parties (both birthday and corporate) on offer, or settle down rinkside each April – August for the Australian Ice Hockey League games, and October to March for the Australian Women’s Ice Hockey League. Check out skate times and events calendar here. 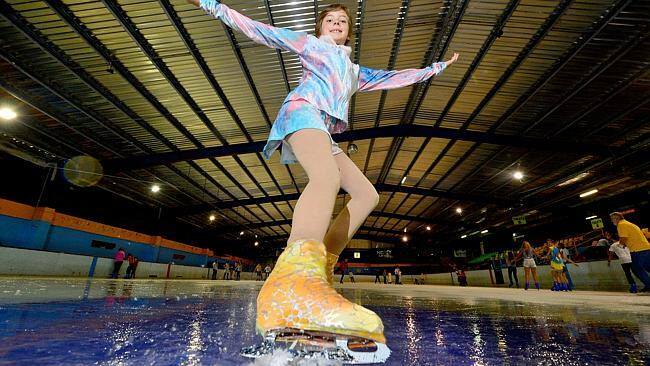 For the eastsiders, the Olympic Ice Skating Centre in Oakleigh South is the place to go – it’s a ton of fun with public skating lessons, adult lessons, speed skating, figure skating, ice hockey, birthday parties, and Fun Fridays, with cut-price skating during school terms. Really though, who can say no to free parking and free skate hire?! And those little penguins that are great for kids to develop confidence out on the ice are available as well (first come first served, though the wait doesn’t tend to be long). Public skate and figure skating session times available here. From the first of June to the end of August, Common Man will be transformed into a riverside ice rink, toboggan slide and literal "chill out" zone! Skate / slide session lasts 45 minutes and begins on the hour, every hour, in the evenings during the week and from noon weekends. Tickets include skate hire as well as use of toboggan & grant access to both the skating rink as well as the toboggan slide during your 45 minute session. For more info and tickets, head to their website. When is Fed Square not Fed Square? Every winter, when it's transformed into an epic ice rink! Bring your family and friends along for a skate while enjoying a picturesque backdrop of the Yarra River and the Melbourne city skyline. Get your skates on and take a spin around River Rink at Fed Square this winter from July 1 to July 23. Ticket cost includes skates and 45-minute skate sessions starting every hour on the hour. For those who are unsteady on the ice, skating aids are available for hire at the box office. Tickets available from June 5, 2017 here. Every year we see more and more winter fun arriving in Melbourne, and the St Kilda Winter Garden pop-up ice rink is a great choice for the usual beachy suburb. The fabulous ice rink is part of the Map 57 festivities, which includes food stalls, bars, carnival rides, and the ever-entertaining Spiegeltent. The rink will be open every day of the festival, with increased hours over the July school holidays. If you're new to skating, kids and adults alike are welcome to hire a penguin skating aid to lean on, and skate hire is included in the ice rink price. Skating At Sorrento is a pop-up Ice Skating Rink located on the stunning and iconic Sorrento front beach foreshore. This is a family friendly event and is ideal for people of all ages and skill levels. Whether you are new to the ice or a pro, Skating At Sorrento has something for everybody. This pop-up ice rink is only in town for a limited time, and you can get 10% off Skate Sorrento tickets if you show your Searoad Ferries ticket at the Skate Sorrento Ticket Booth. More information: at the website.